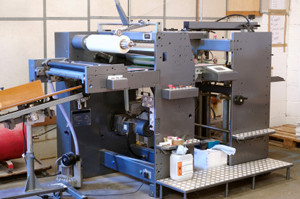 For larger lamination jobs, the Blazer Laminator is an ideal solution. It can seal documents up to 24 inches in width in 1.5 and 3 mil laminate. Up to 22 inches wide in 5 and ultra thick 10 mil laminate. Documents up to 36 inches in width can be laminated on the larger model in 3 mil.The varying speed settings allow for all kinds of paper, including newspaper, magazine stock, index cards, file folders and poster board.